Brampton resident Leif Jorgensen standing in Brampton, England. 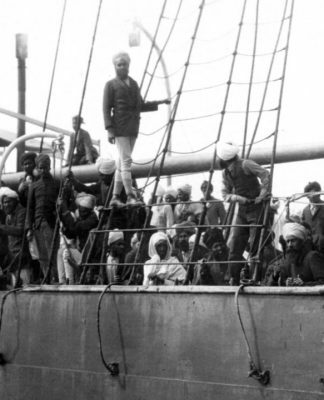 We live in Brampton and love living here, but there is another Brampton, located an ocean away, which our city is named after. It is much older and was recently visited by a resident who calls this Brampton home. 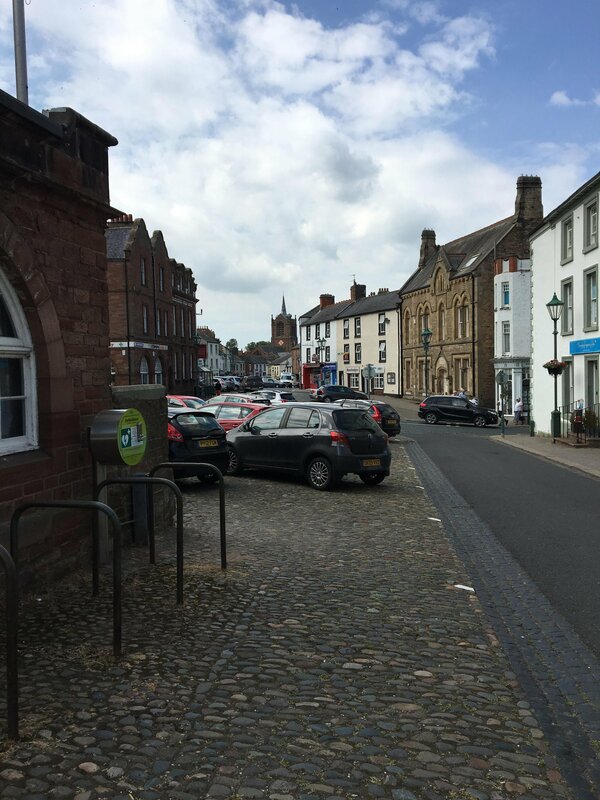 Brampton, Ontario, resident Leif Overgaard Jorgensen recently toured the U.K. and made a stop in Brampton, a small town located within the district of Cumbria in northwest England. Jorgensen prepared a collection of photos and submitted them exclusively to Stand UP for Brampton for us to share with you. 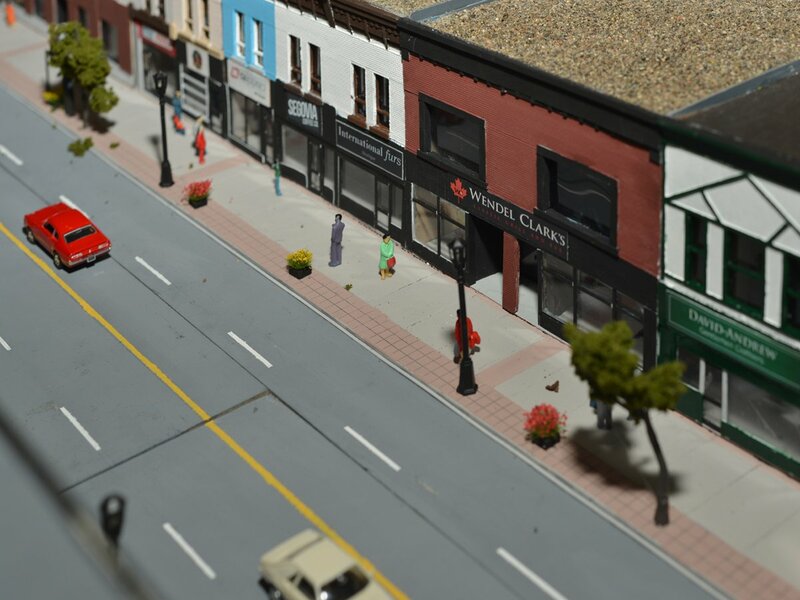 The “olde” Brampton was founded in the 7th century, and today is home to 4,627 residents. 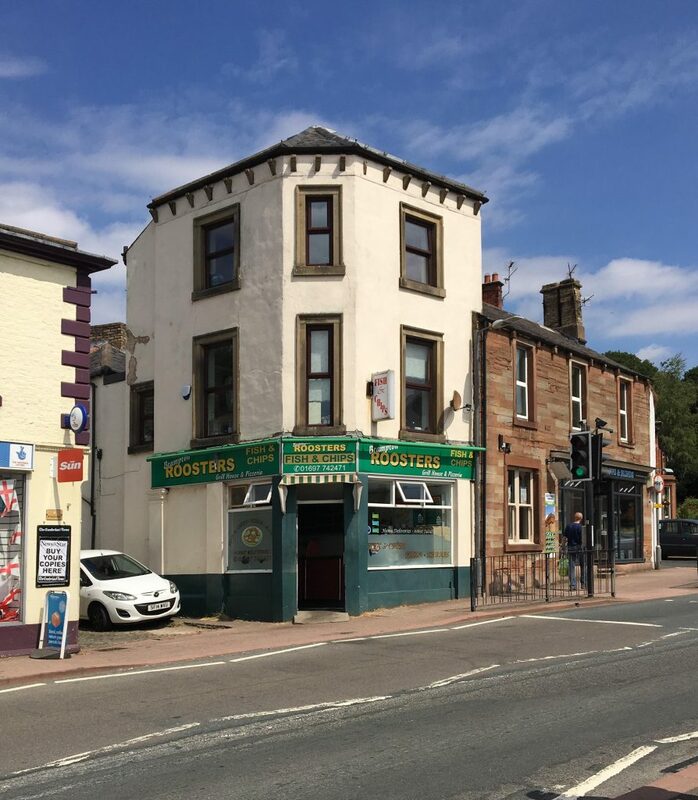 The town consists of many historic buildings, shops and homes, surrounded by pastoral fields. 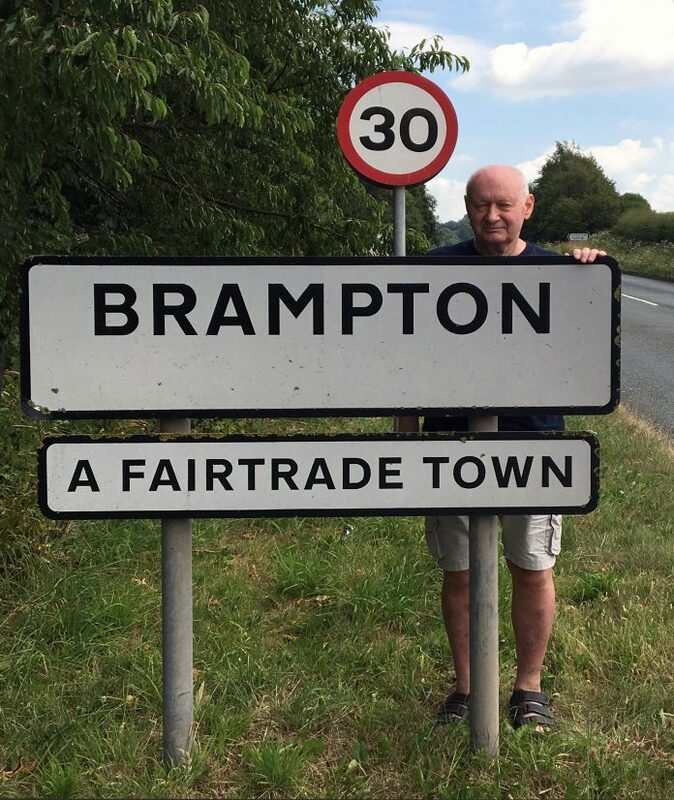 According to Jorgensen, the name “Brampton” takes its origins from the early settlers who immigrated to England from Holland. The Dutch word brombaer in English means “blackberry”, and ton is “town”, so “blackberry town” became Brampton. 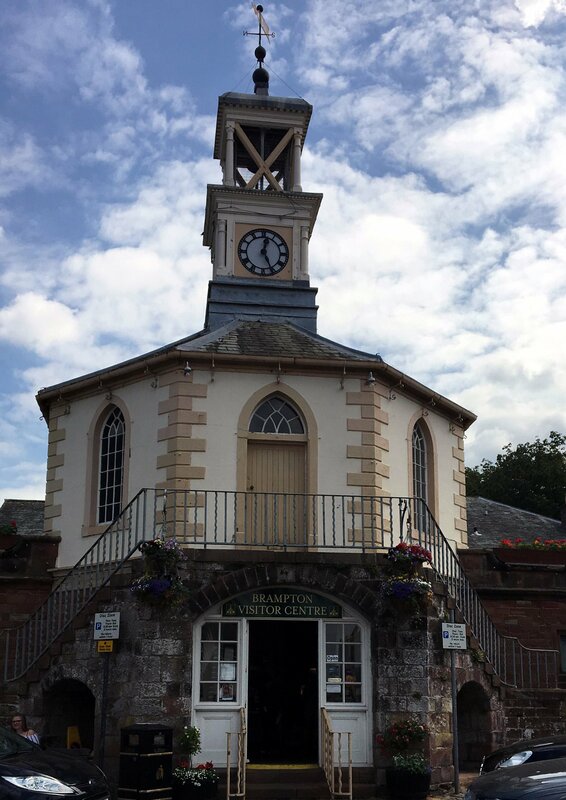 Brampton is a small market town and still features its original town hall with a distinctive clock tower. 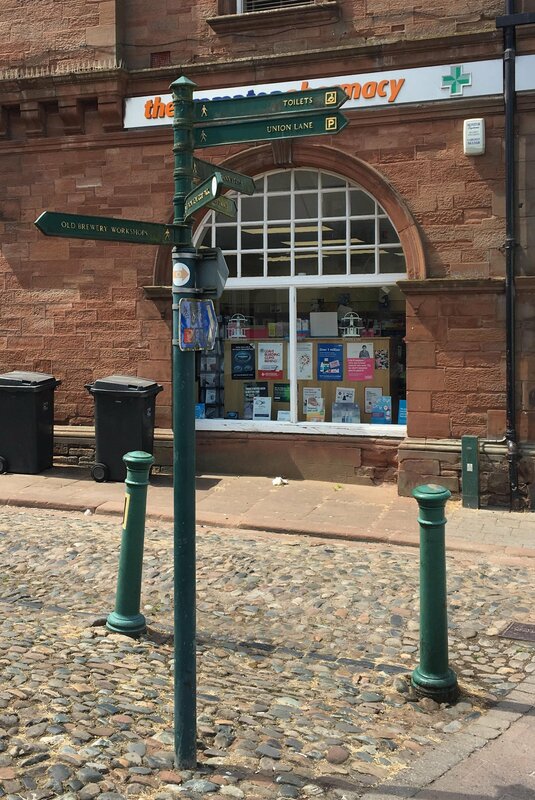 The octagonal structure is located in the centre of Brampton and today houses the tourist information centre. The original cobblestone streets and the heritage buildings give the town a very authentic look and feel. 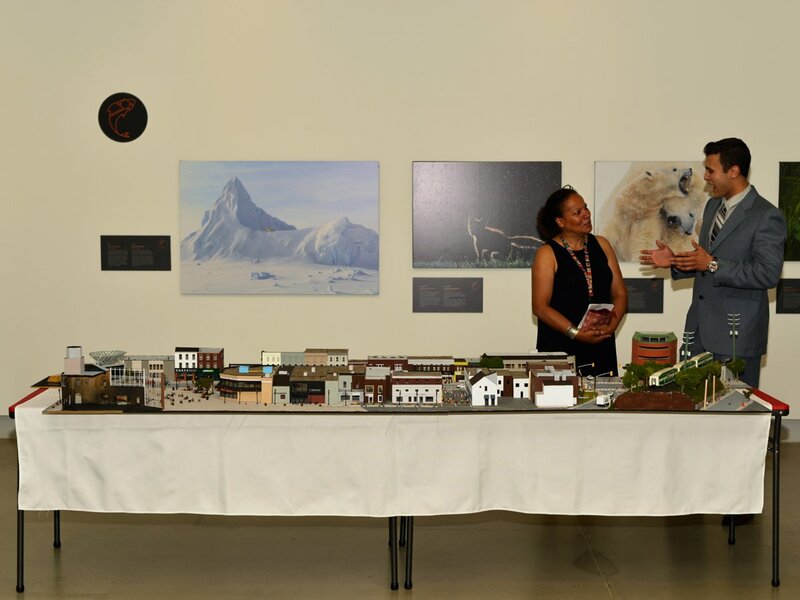 Jorgenssen says he travelled to the town specifically to take photos of the original Brampton for all of us to be able to see and enjoy. Market Place, located in the centre of the town. Brampton Roosters, a fish and chips place. 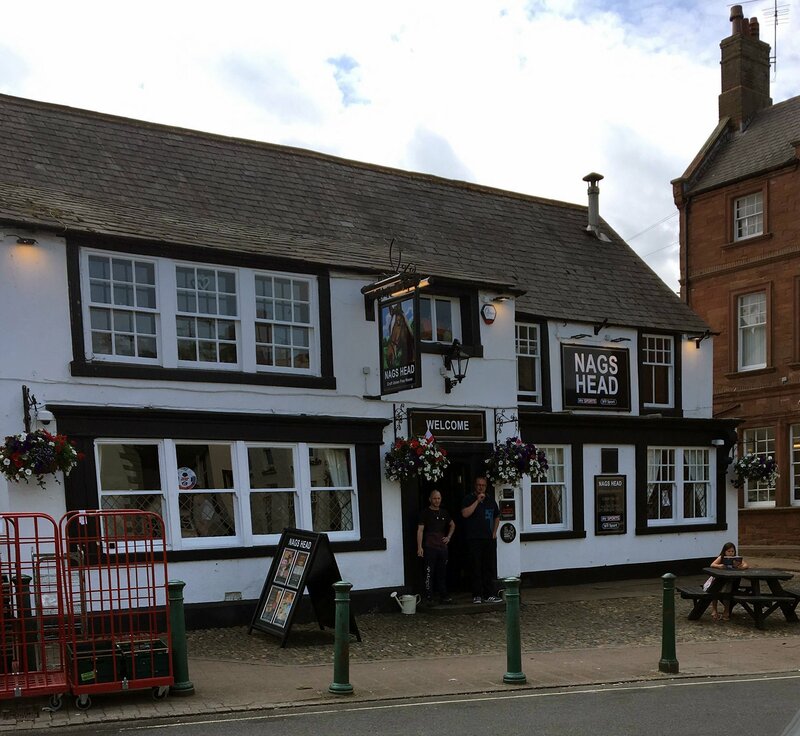 Nags Head, a pub located in the centre of the town. 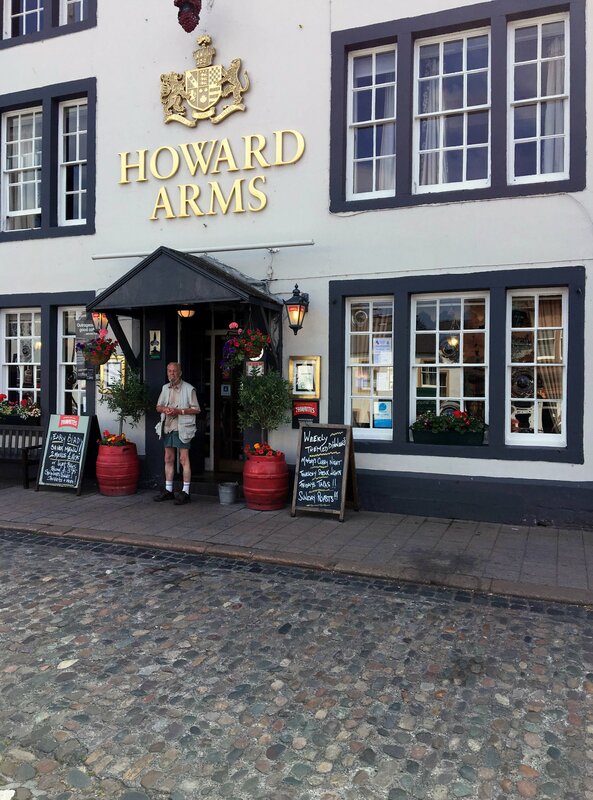 The Howard Arms Hotel on Front Street. Elections used to be about issues. There are so many of them. Fiscal issues, family issues, transit, infrastructure, auto insurance, healthcare, et cetera. In this provincial election, we don’t seem to be talking about issues. Much. Instead, the media reports are filled daily with stories about scandals, candidates’ transgressions, sordid stories about familial disputes and even wardrobe choices. Ontario holds the largest non-sovereign debt in the world. With a debt approaching $330 billion, the interest payment to service the debt exceeds $12B every year; that’s more than what we spend on colleges and universities. Where do the parties stand on this? How do they plan to address it? Here in Brampton, we are experiencing a crisis in healthcare. Last year, 4,352 patients were cared for in the hallways of Brampton Civic Hospital, an issue brought to light after Brampton resident Jamie-Lee Ball recounted her ordeal of spending five days on a stretcher in a hallway while bleeding internally and in severe pain. A city of over six hundred thousand people is served by one emergency room and an urgent care centre that is open just fourteen hours a day. We have a single full service hospital equipped with six hundred beds, less than half the national average of 2.6 hospital beds per 1000 people. What are the leaders of the parties prepared to do to fix healthcare? For more than a decade, Brampton has been mandated by the Province to grow, a policy that has led to unprecedented growth in our city. Unfortunately, without the necessary funding to build infrastructure and to pay for social services, residents have been forced to pay more and more every year through their municipal property taxes. How will the province help cash-strapped municipalities? Auto insurance is a huge issue in Brampton. 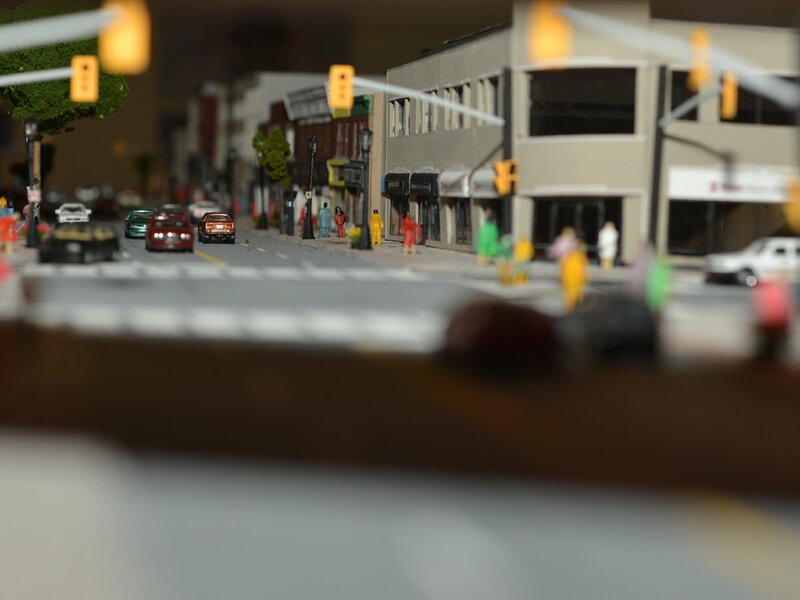 Compared to the provincial average, Bramptonians pay 44 per cent more for car insurance, with some folks paying substantially more than others who live on the opposite side of the street. What can be done to help drivers in Brampton? Are we even talking about these things? Where do the parties stand on these issues? What are the solutions to these problems? 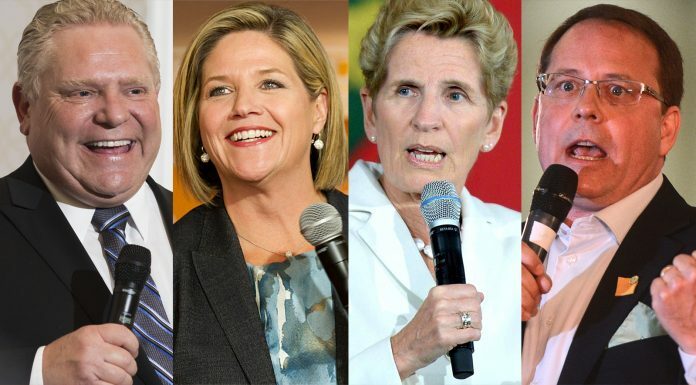 On June 7th, Ontarians will go to the polls, and a new government will be chosen. There will be winners, and there will be losers. The biggest losers are citizens, because in the era of super-short campaigns, scandalous headlines and ten-second soundbites, we have not heard the detailed positions of the political parties. Elections should be about issues. Make sure you vote. Make an informed choice. 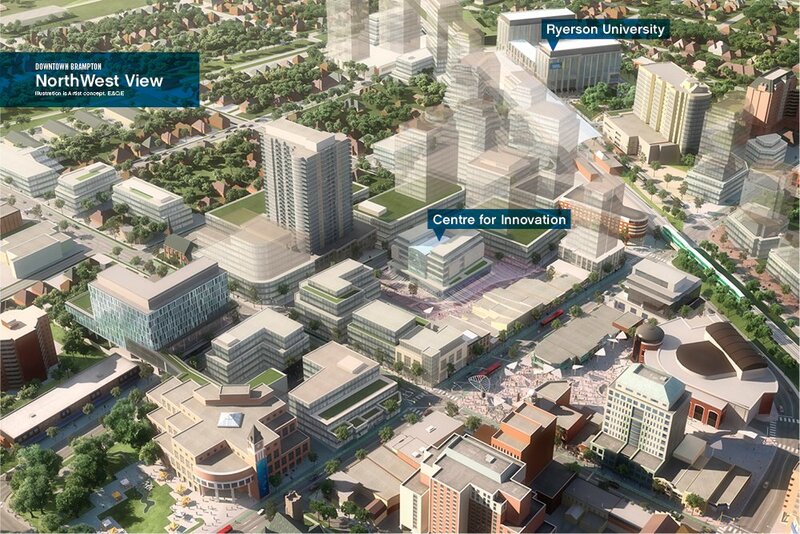 Vision of "Central Uptown", currently the Powerade Centre lands. 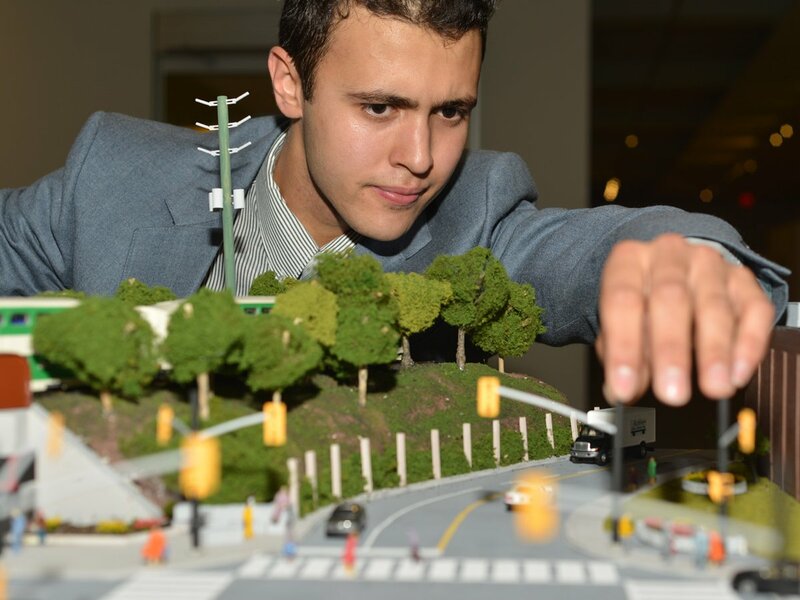 The City of Brampton hired award-winning urban planner Larry Beasley to develop a new, future-ready vision of out city, and after a year of consultation with residents and stakeholders, Beasley’s “Brampton 2040 Vision” document will be presented to Members of Council in a special meeting on Monday. 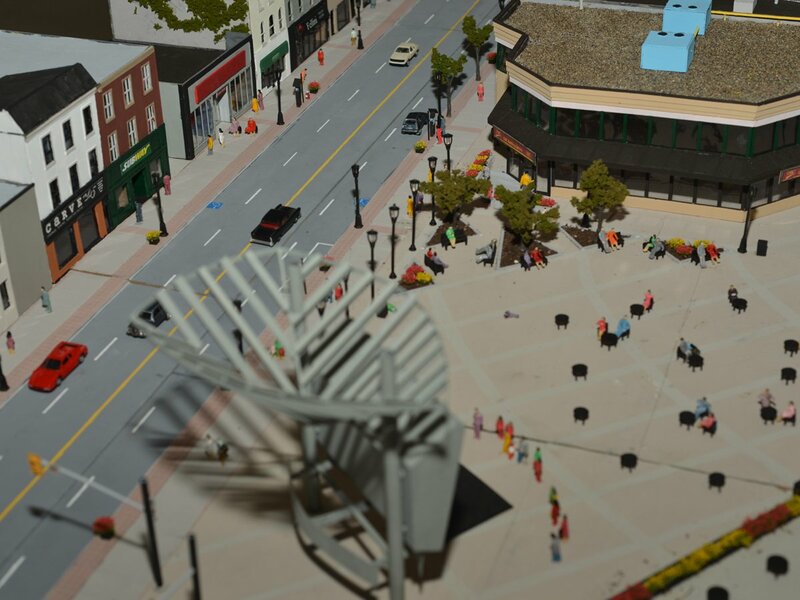 Called “Living the Mosaic“, Beasley sees Brampton’s future as one where the city offers a mosaic of places and spaces where residents from all backgrounds can live, work, celebrate, learn and be connected. 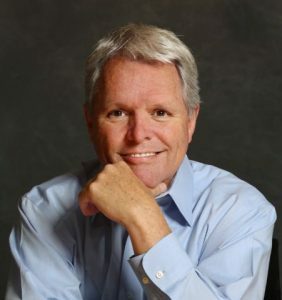 Larry Beasley, worked to transform Vancouver, Abu Dhabi, Dallas and Moscow. In Vancouver, he helped usher in New Urbanism, where communities incorporate environment, walkable neighbourhoods, and an ideal ratio of housing to jobs. Beasley was awarded the Order of Canada in 2004 for having “played a leading role in transforming” Vancouver’s “downtown core into a vibrant, livable urban community”. 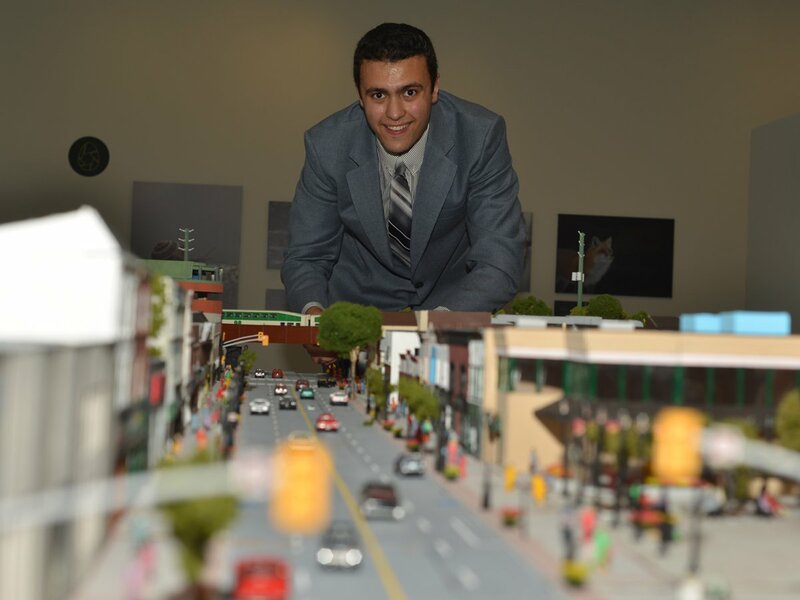 Harry Schlange, Brampton’s new Chief Administrative Officer, who the City hired in 2016 to take the top post at the city, brought in Beasley to consult with Bramptonians and prepare the vision document with a budgeted cost of up to $500,000. The process tapped input from residents, and over 11,000 people contributed specific comments and ideas. 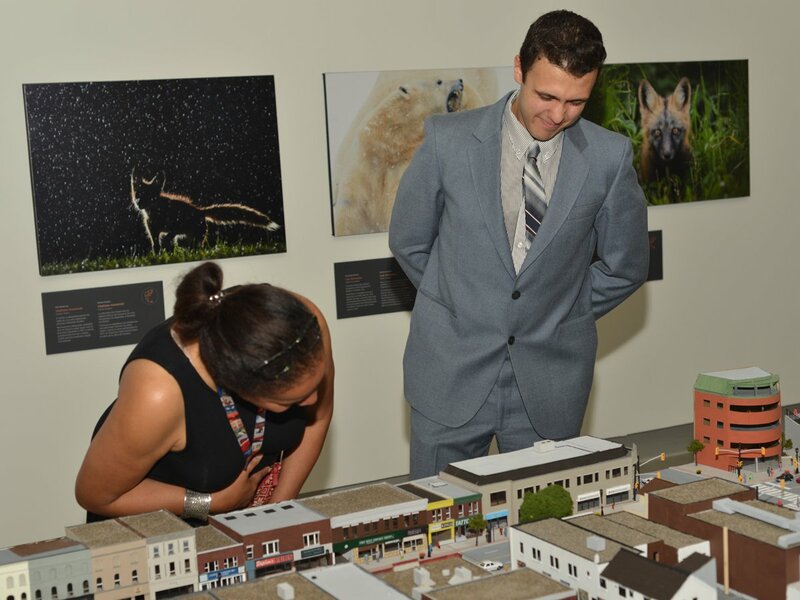 The vision sees the creation and development of a new Brampton Core which enfolds the historic Downtown and a new, centrally-located Uptown. 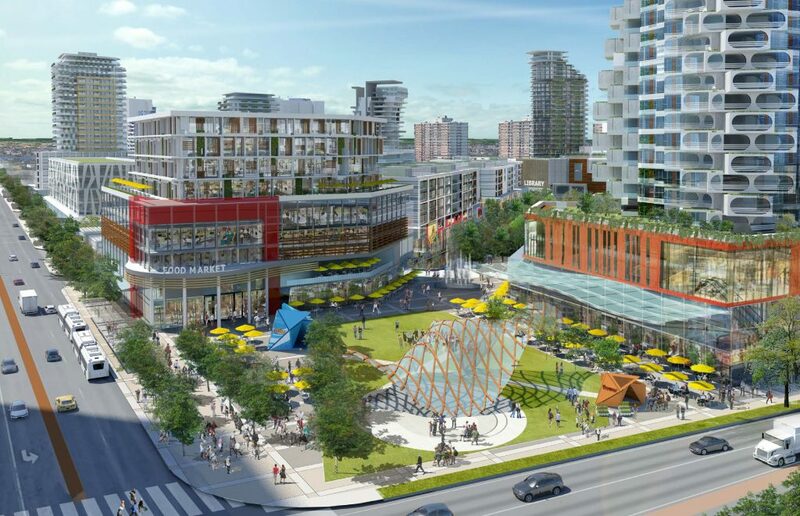 Designed to compete with nearby regional centres, Uptown would become Brampton’s corporate hotspot and tourist destination. Uptown extends from the Hurontario and Steeles area where present-day Shopper’s World is located, to the 410 and 407 highways area, where the Powerade Centre presently stands. 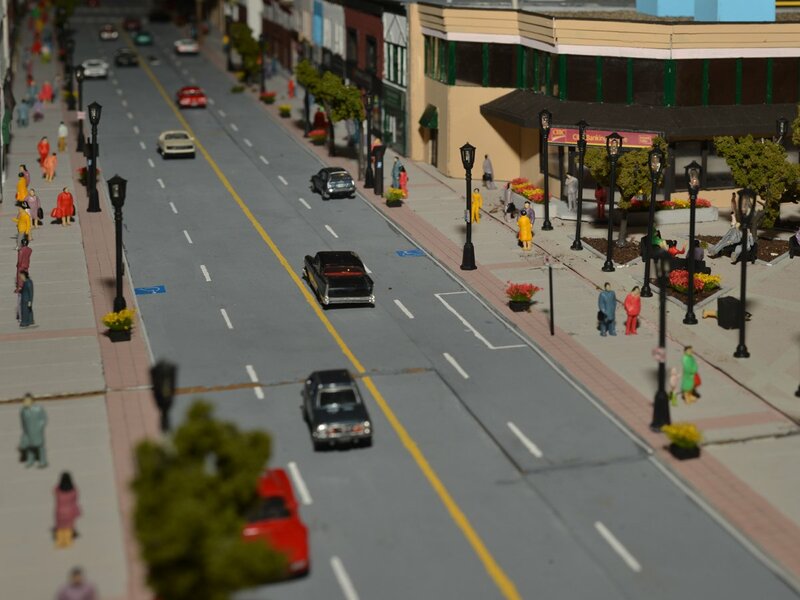 Artist’s vision of Brampton Uptown, intersection of Hurontario and Steeles. 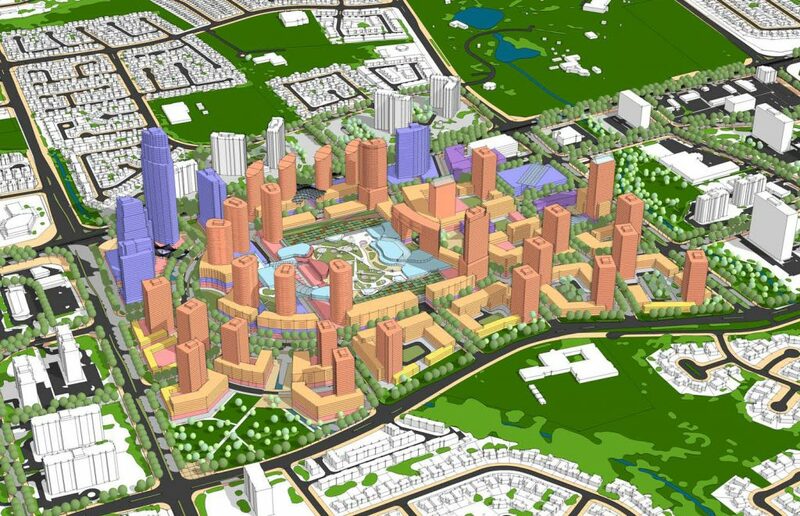 Beasley sees large, available tracts of land as the first opportunity where development can happen almost immediately, and as the city progresses over time, parcels where development currently exists may become potentials for redevelopment. 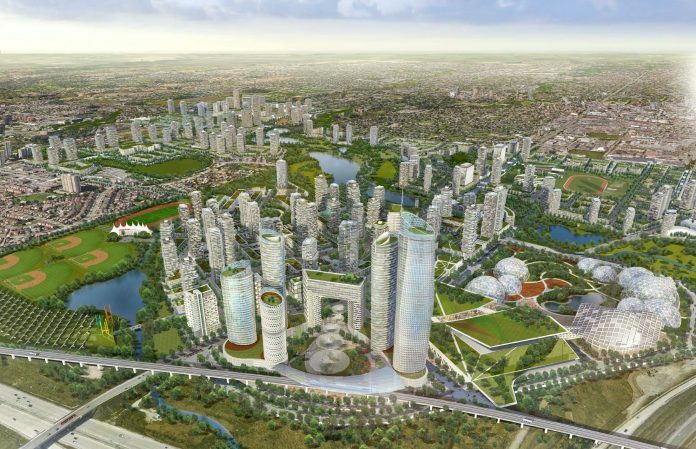 Existing greenspaces, trails and river valleys, cherished features of the city, complement the overall layout. Promoting cycling is seen to be an important component of this vision. 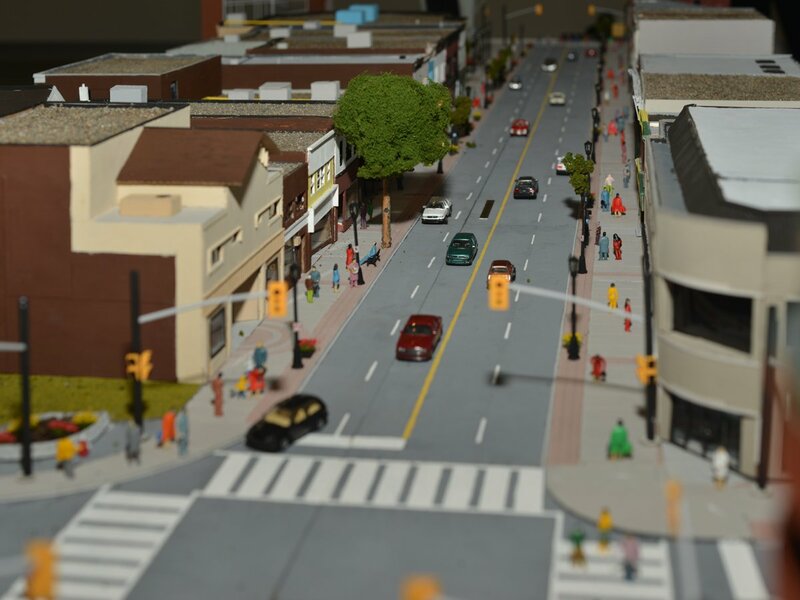 The vision call for the development of Five Town Centres, one in each sector of Brampton, so that mainstream companies and businesses that do not need the core profile and do not want the higher rents can nonetheless come to Brampton and enjoy complete urban offerings and lifestyle at their fingertips. This brings more jobs home to Brampton. 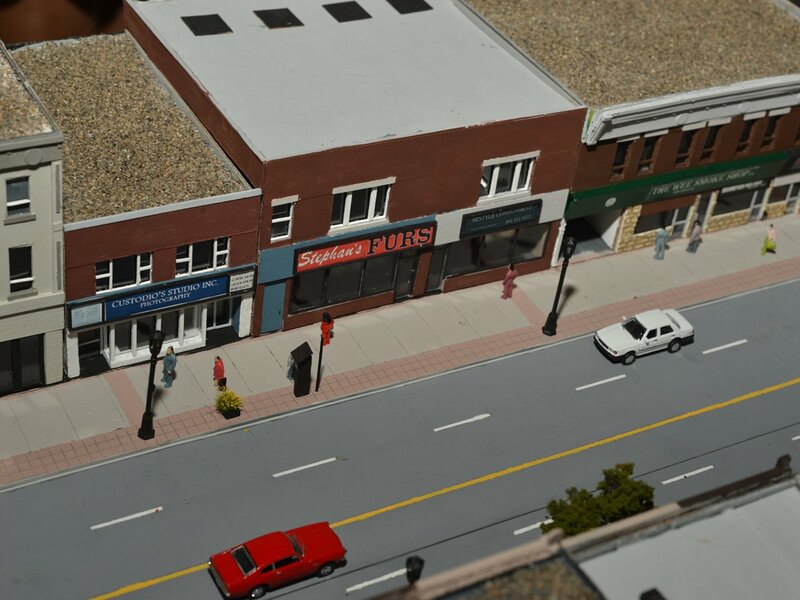 These centres are lower-scaled and walkable. Five Town Centres surrounding the new Brampton Core. 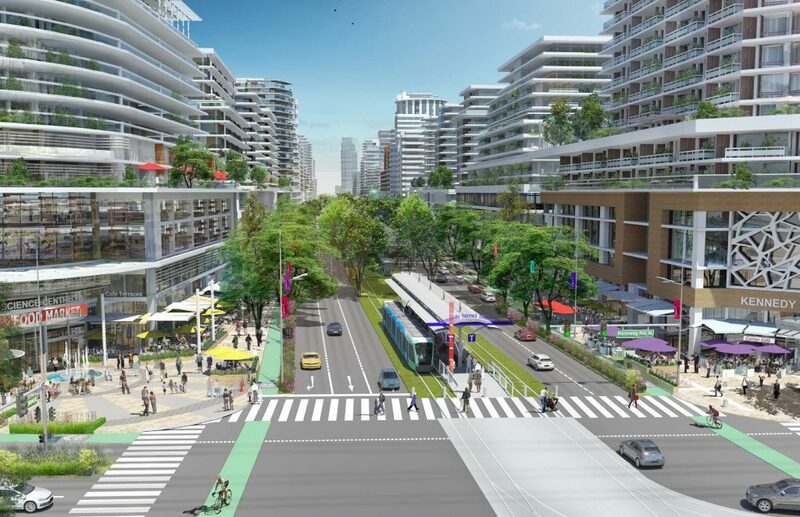 A bold new vision for a Bramalea New Town updates and revitalizes the area with the addition of mid/high-rise residential buildings, more street retail offerings, and a new rapid transit station. New districts will offer a broad mix of features including a canal walk, farmer’s market, a redeveloped mall, office space, hotel, library and performing arts centre, in addition to recreational places including a gym, pool, ice rink and roof gardens. 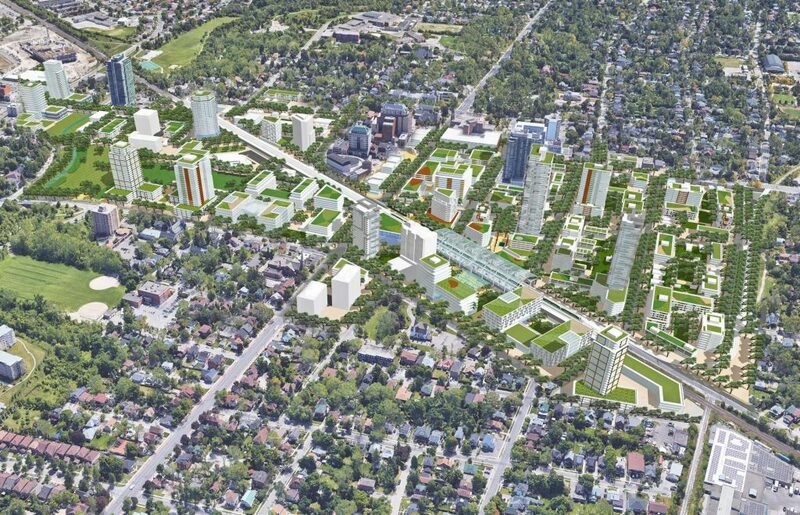 Vision for Bramalea New Town, surrounding a redeveloped retail mall. 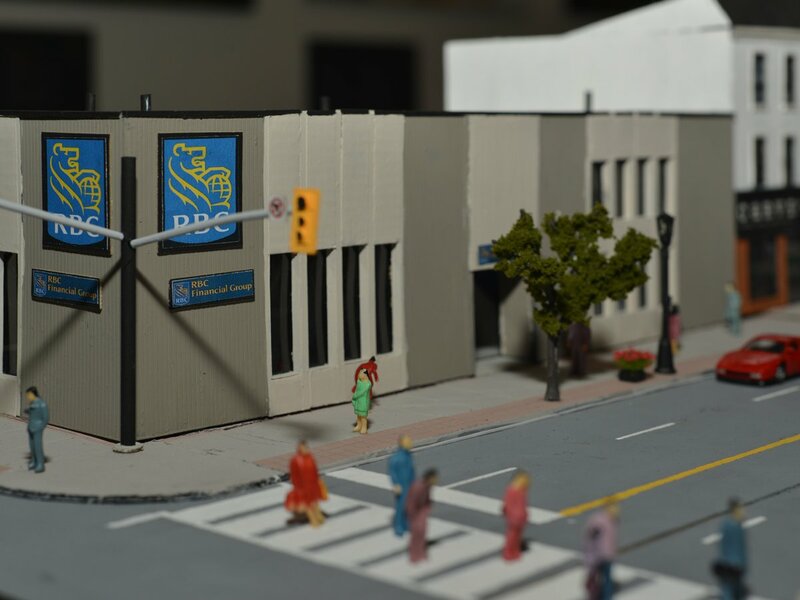 The Downtown Brampton vision utilizes the just-announced Ryerson University as the game changer which sets the area on a path towards much-needed revitalization. 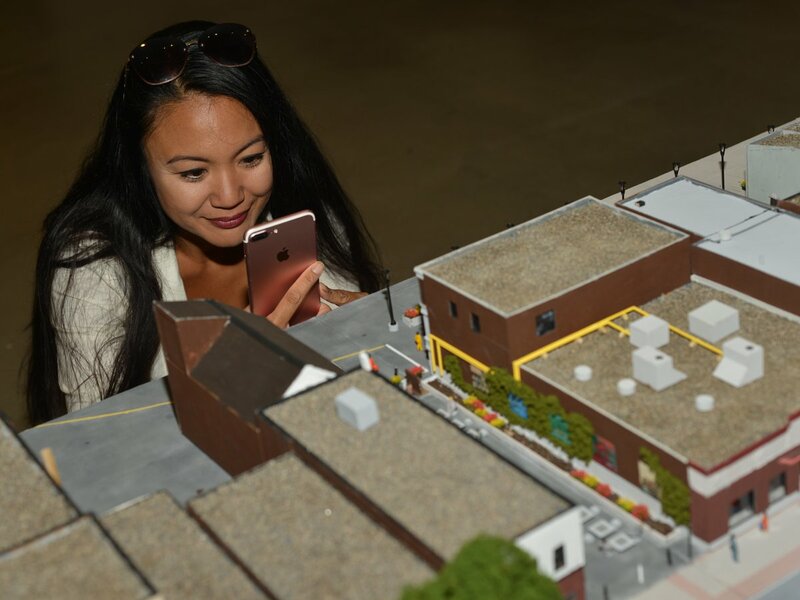 The university brings a new purpose to the area, and with an eye towards preserving heritage and bringing in new development, downtown will become a place where Brampton can showcase its natural, cultural and built heritage. Through innovative design, Beasley sees modern and historic elements coming together to build unique and high-value uses. With the presence of City Hall, the area can continue to build on its civic purpose, and with the right investments, can become a place with a special vibe, thanks to festivals, culture and arts. 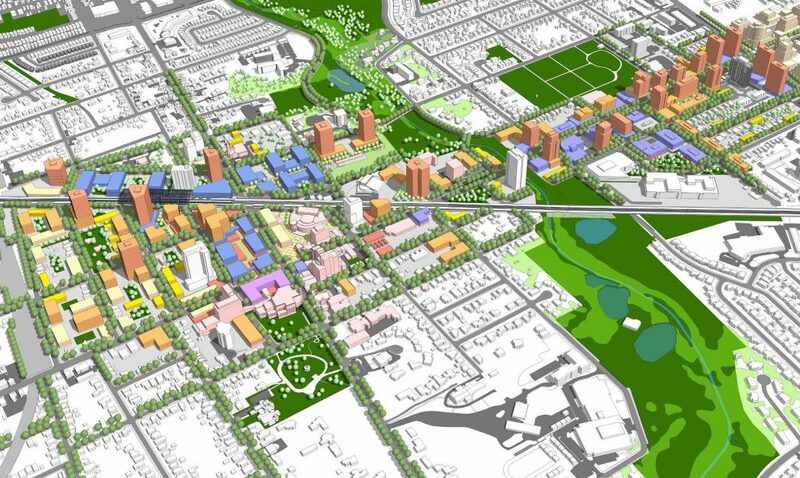 With a hospital and university as anchors, growth and redevelopment in the downtown area is likely to accelerate. 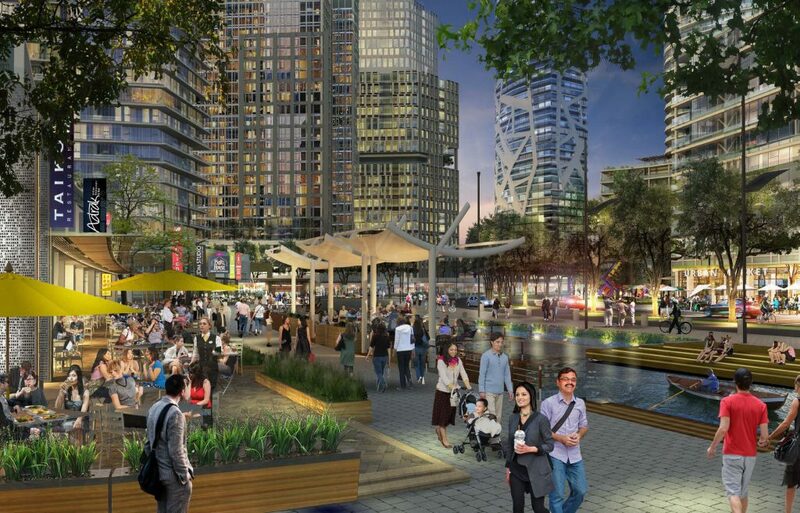 The vision requires the Riverwalk project to proceed, thus removing barriers to residential development. The Riverwalk project is currently being studied, and if completed, would prevent the Etobicoke Creek from causing floods in the downtown area during major rainfall events. The vision for the Queen Street corridor takes shape as Queen’s Boulevard. With anchors located an each end (Downtown and Bramalea), Queen’s Boulevard is destined to permit a lifestyle where everything is immediately at hand. Queen’s Boulevard, artist view looking east from Kennedy Road. 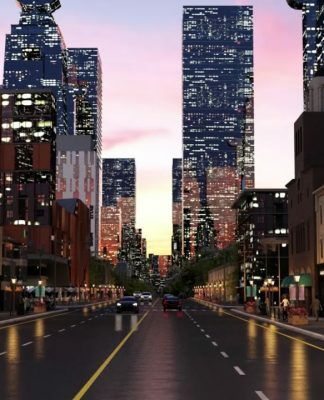 Queen’s Boulevard will be a tight corridor of higher density and scale with mixed uses and continuous commerce at grade. 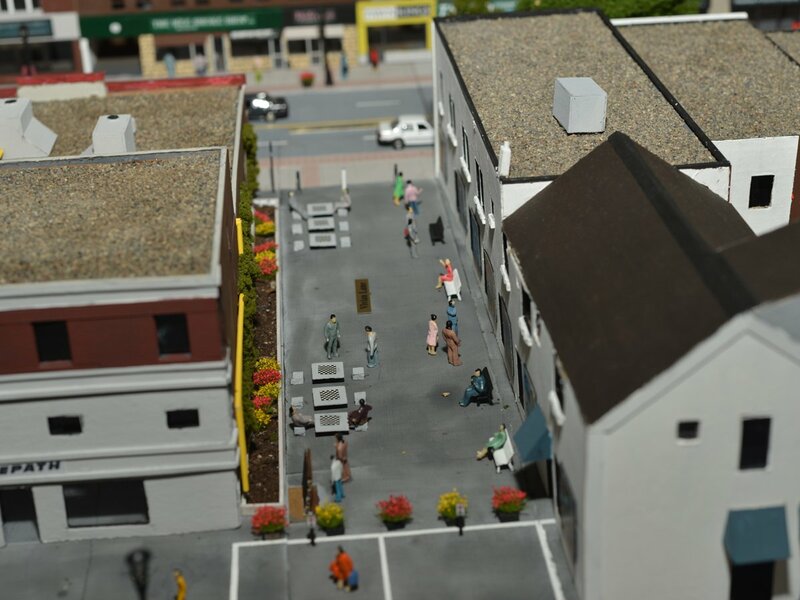 Buildings will all adhere closely to the street with a continuous streetwall and activities spilling out on ample sidewalks – cafes, shopping, and amenities – with several lines of large trees and special lighting. The area would be highly walkable. 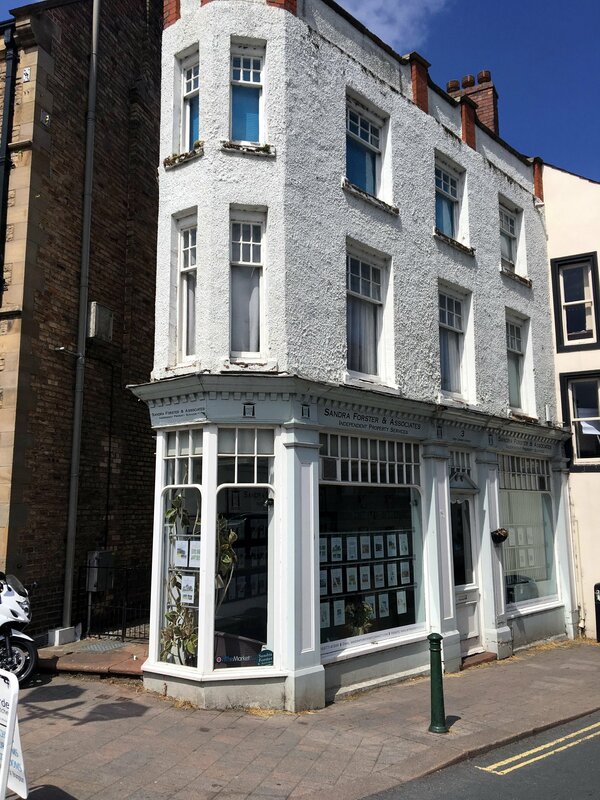 Behind the front row of buildings, a second row of development, on the parallel streets, scaled to step down buildings from the central spine, could ultimately reinforce the corridor. 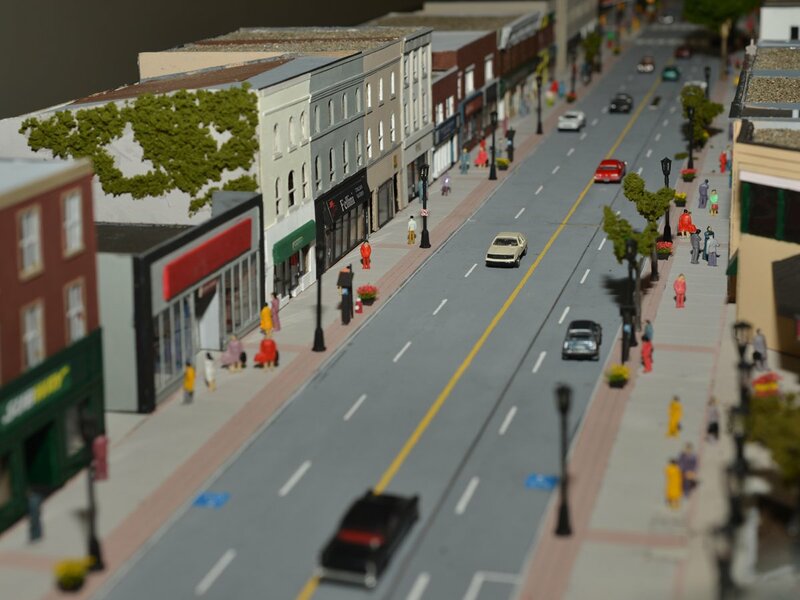 To spur developer and consumer interest and action along the Queen’s Boulevard, Beasley is urging the City of Brampton to build out key components of the public realm design scheme to confirm the new image of the boulevard, and then, work to pull in new builders, tenants and uses that contribute to the vision for the area. 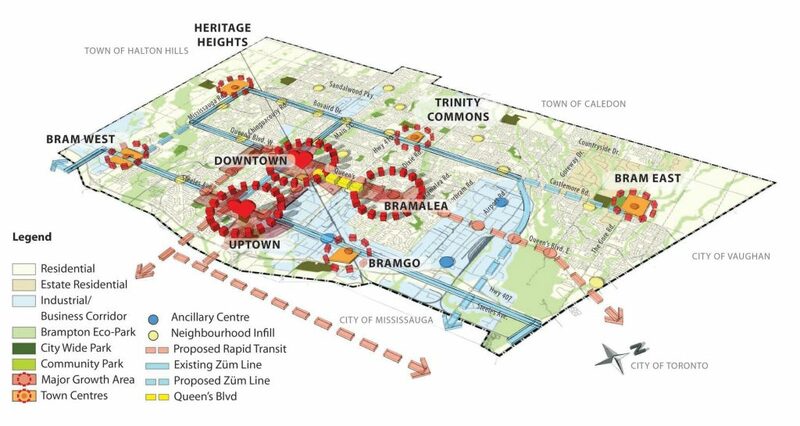 There is much more contained in the vision document, including suggested transit alignments, an initiative to implement 100% free transit by 2040 to promote car-free travel, a recognition that our proximity to the airport and position in the GTHA continues to make Brampton an important logistics hub, a call to action to build affordable housing, strategies to encourage healthy lifestyles, promote sports, and arts and culture, and a strong emphasis on integrating job creation strategies into every opportunity as the plans to make this vision happen unfold. Bramalea New Town Canal Street artist image. Now, what remains is for the City to endorse this vision, if it so chooses, and begin to put in place the framework and strategies to ensure that it is successfully executed. 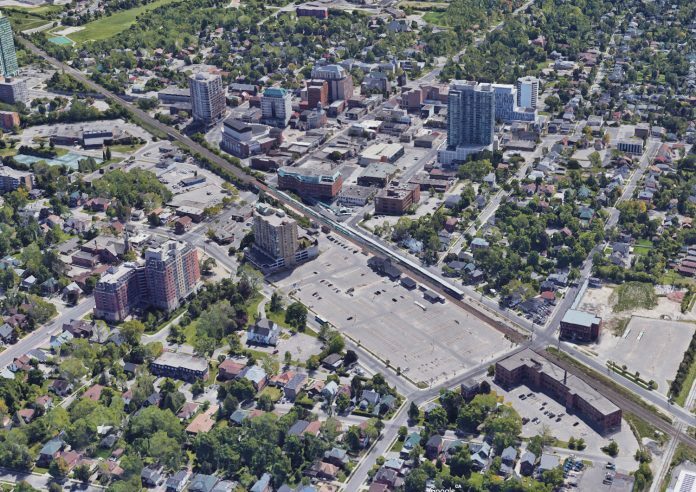 Will Brampton move ahead? 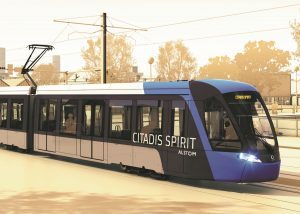 Will we see this vision approved and steps taken, over many years to see this vision become a reality? With a firm resolve and the support of the people of Brampton, that answer can be affirmative, and the we may find ourselves on a path towards 2040, confident in knowing where we are headed, and what the end result can look like. You can read the entire vision document by clicking here, and be sure to watch Larry Beasley’s presentation to Members of Council on Monday evening at 7 PM on the City of Brampton website. Will the construction of a new university in Brampton mean that parking will be eliminated as a result of Ryerson’s building plans? Not likely, according to Metrolinx. 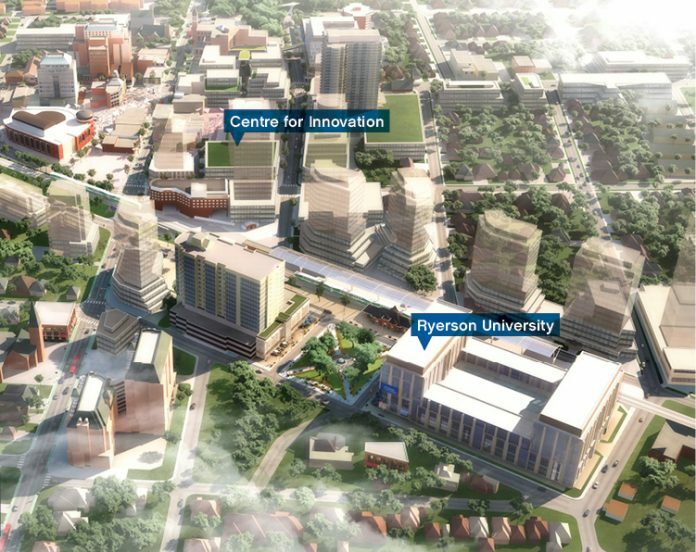 The City of Brampton has released images that define the precise location of the new university to be built by Ryerson University in partnership with Sheridan College, the City of Brampton, and Metrolinx. 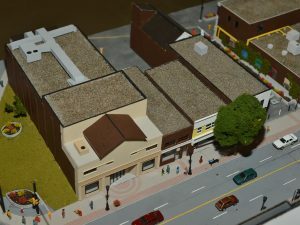 Located on the existing GO Train Station Parking lot, the renderings show a building located at the corner of Church Street West and Mill Street North, covering an area of approximately 3 acres. 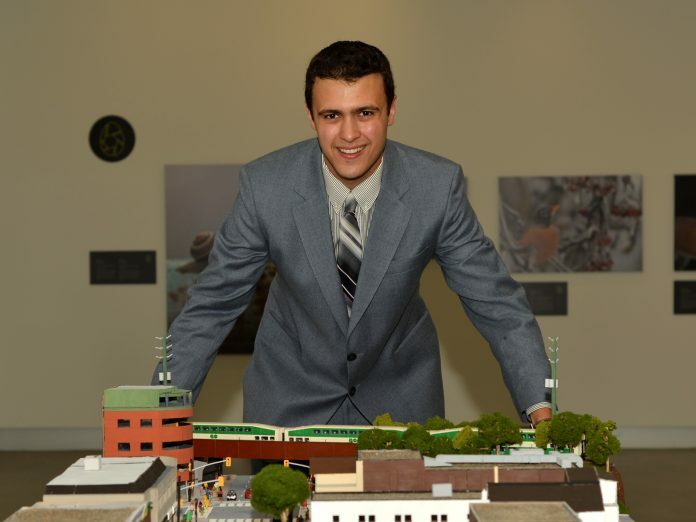 The renderings are conceptual only, and do not represent the final plans for construction; however, Bramptonians who use the GO Train service have flooded social media with questions regarding the potential loss of parking that would occur as a result of building the new university there.  Stand UP for Brampton reached out to Metrolinx for comment and, according to spokesperson Anne Marie Aikins, GO users can rest assured that any plans for construction will incorporate a plan to ensure their parking needs are met. Transit users have noticed boarded-up homes in an area located directly south of the train station, along Railroad Street and Elizabeth Street. Metrolinx has been acquiring property there, likely in anticipation of a future need for their customers. 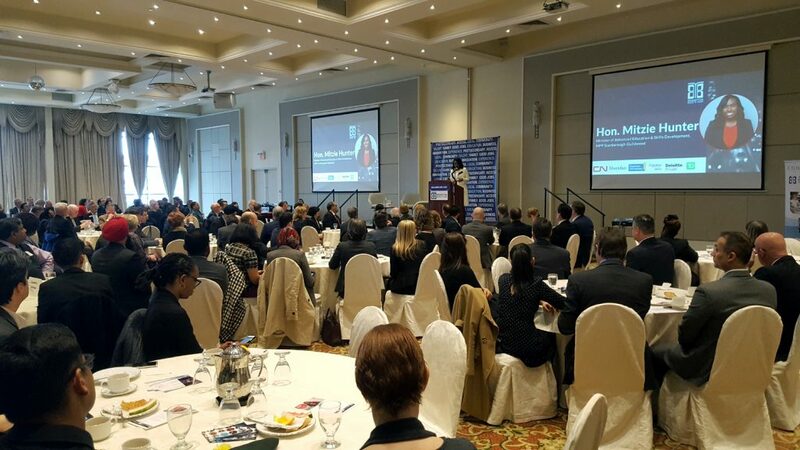 Bringing a new university to Brampton has been a key priority for the City. 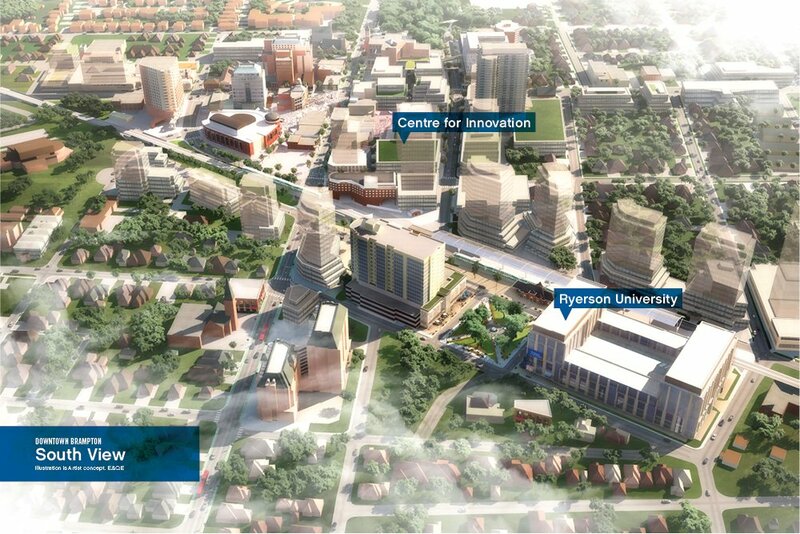 In September 2017, Brampton City Council made a historic commitment of up to $150 million for a new university and centre for innovation. The Province has committed $90 million. 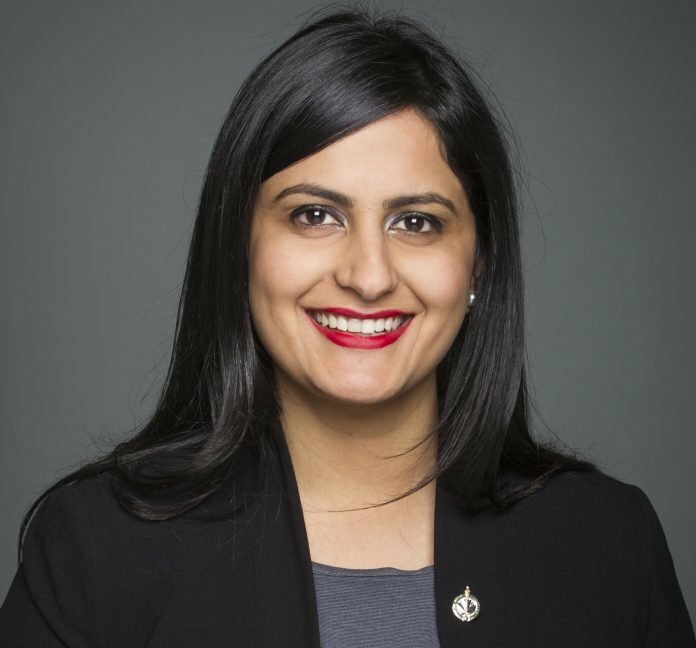 In a press release Tuesday, Ruby Sahota, MP for Brampton North, said that she is working to ensure the Federal government is not on the sidelines with regards to support for the university project. “I look forward to continue advocating for federal involvement in this project and others because this university will be a game changer,” stated Sahota, in her release. In March, Stand UP for Brampton interviewed Ryerson’s President, Mohamed Lachemi who spoke powerfully about his desire to see Ryerson become tightly integrated within our community, emphasizing Brampton’s unique geographical positioning within the innovation corridor of the GTA. The project has an anticipated academic start date of September 2022. As Brampton begins to realize the dream of a STEAM-powered university to drive the future, today our city is standing tall on the STEM world stage. 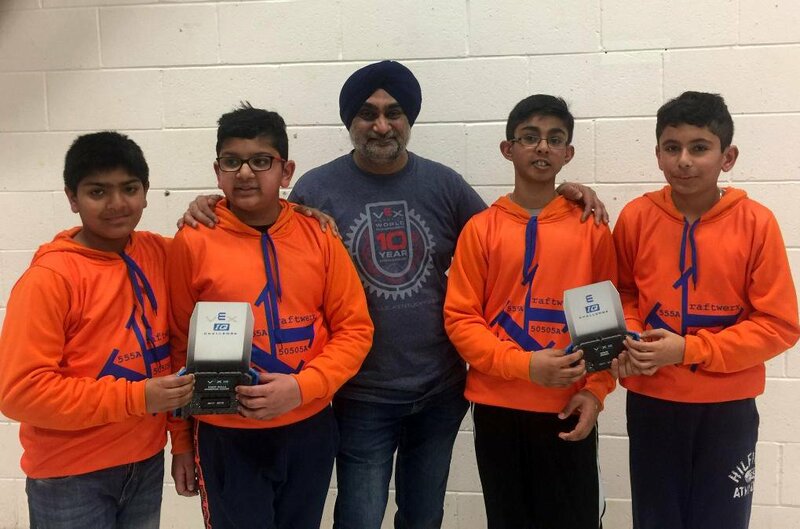 A number of student teams from Brampton are set to take the world stage at this year’s VEX World Robotics Competition held in Louisville, Kentucky. 400 teams will be competing, with fifteen teams hailing from Brampton. VEX Robotics Design Systems, in association with the Robotics Education and Competition Foundation, has been hosting regional, national and global tournaments for 11 years in their effort to encourage youth around the world to pursue STEM (Science, Technology, Engineering and Math) studies. Over 20,000 teams from 40 nations have competed. Castlebrook Secondary School is sending three teams. North Park Secondary School’s Viking Robotics is sending four teams. A team originally from Chinguacousy Secondary School who, since its 2014 championship, has continued as the not-for-profit organization called Brampton Robotics is sending six teams. 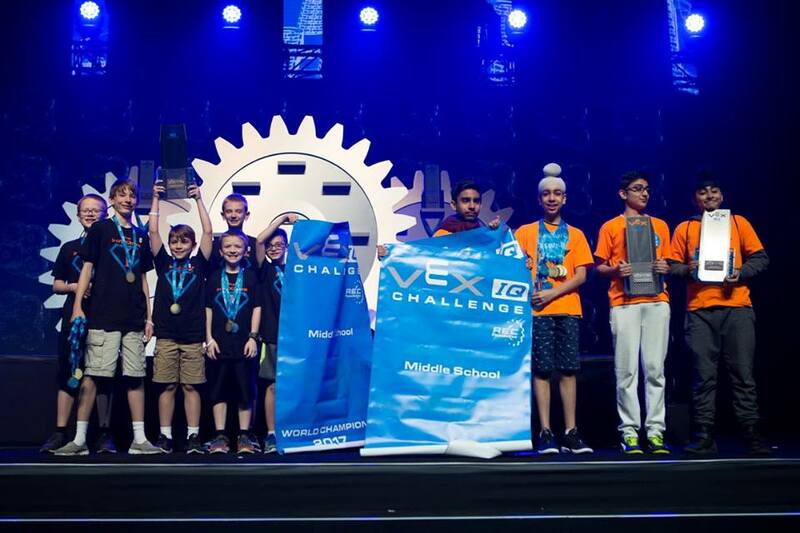 Known as Discobots, they were also the 2016 VEX World champions in both the High School and Elementary categories. 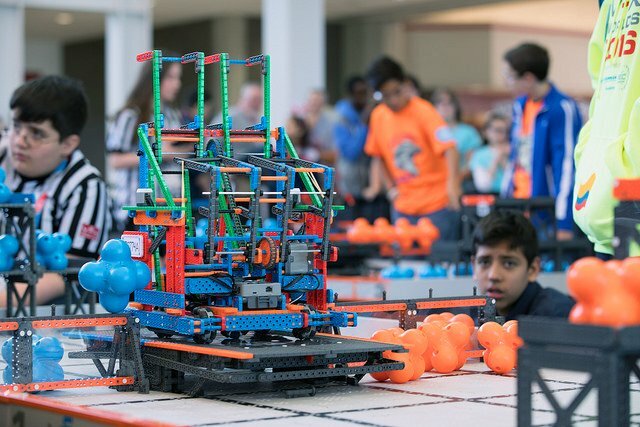 Returning to this year’s competition as 2017’s VEX IQ Challenge Middle School World Champion, winner of the VEX IQ Challenge Robot Skills and two other awards, are the KraftWerx Gladiators, a team of Grade 9 friends from various Brampton area high schools. This year, they move up a class to the High School categories and a new foursome of Grade 7 & 8 students assume their winning team number, 555A. Typically, cities only see one or two teams making it this far. 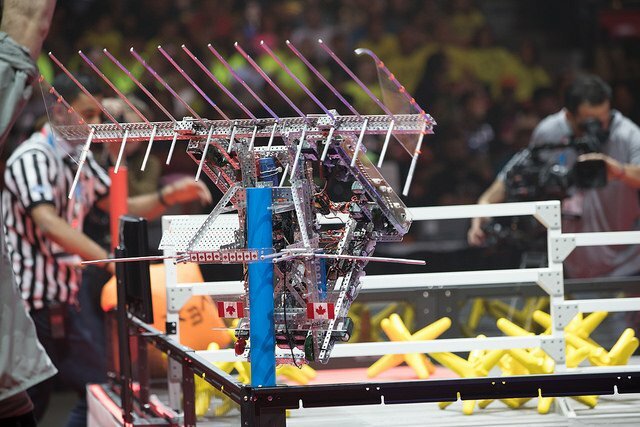 The fact that Brampton is sending fifteen of the top 400 teams to the VEX World Championships is outstanding. 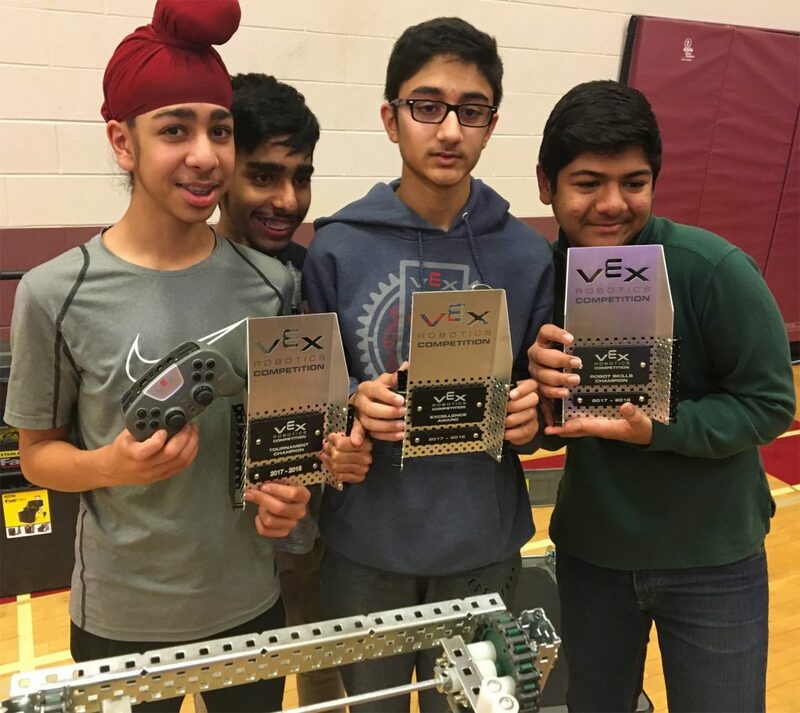 We are actually sending more teams than most provinces and, according to VEX World’s PR firm, Brampton consistently does well on the national and global stages of these competitions. Each year, VEX Robotics challenges the student teams with an exciting engineering problem in the form of a game. This helps the learning process by giving both beginner and advanced students an achievable goal to work towards in an extremely supportive environment, with mentoring by teachers, coaches and peers. 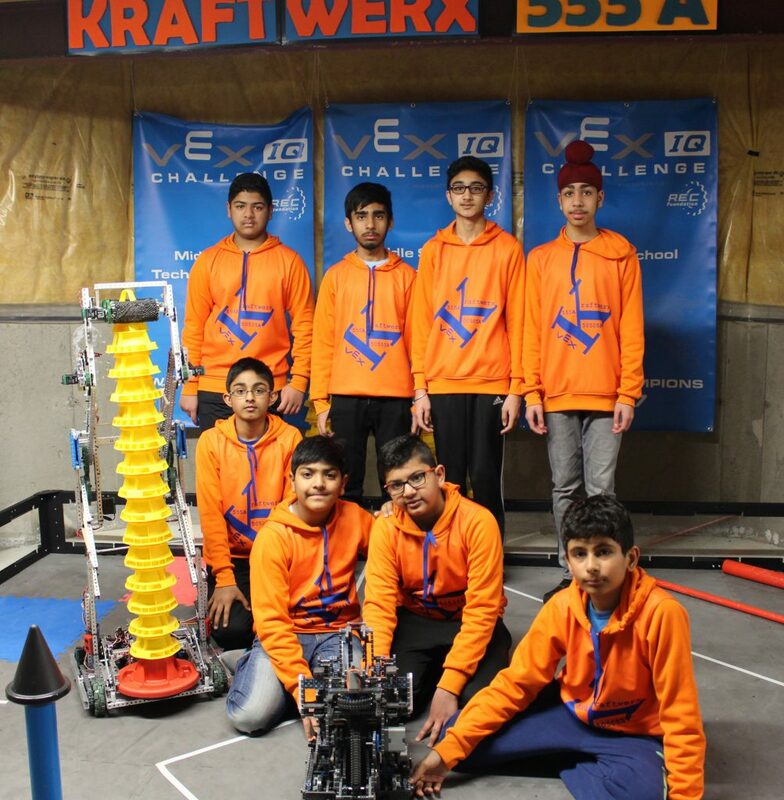 KraftWerx is not a school team; it is a home-based robotics group with a mechanical engineer and father as their coach. “It started with my son,” explains coach Saranjit Wilkoo. “He saw all my tools while growing up and I would find him playing with them. A few years ago, these guys were all on their laptops, playing games. I said, Let’s use the laptops for something more results-oriented.” That’s how Saranjit got the kids involved in these ongoing STEM-based games that lasts 8-9 months. He couldn’t do it alone, so he called up friends and work colleagues from the Brampton area and found more kids that were like-minded and wanting to get into robotics. “Our robot is a lot more complex than the one we built last year,” begins Saranjit’s son Tejas Wilkoo. “We always build our robot around a specific game. This year, VEX designed it so we must stack cones.” With great detail and easy wording by Tejas and the team, it was easy to understand the mechanics of their sport. “The way to make points is determined by how we play with an allied team against two opposing teams,” Aryan Shah explains. At the beginning of a game, they meet their allies for the first time and only have a set time to collaborate and strategize with them. “The brain of the robot is here,” points Sahaej Arora, as their robot works from their ability to manipulate its behaviour through the technology provided. Though there is no combat, it is very competitive – a battle of wits using joysticks and computer programming. Working as a team is one of the life skills achieved, as demonstrated by how smoothly explaining the mechanics of their operation passes from one to another, like a baton in a relay team. 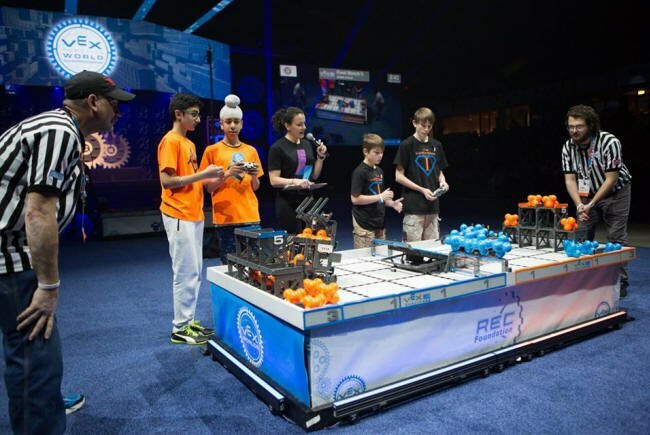 The new junior team, including middle school students Darsh Panzade, Aryan Shah, Shaan Mehta and Hrishi Taylor, is in its first VEX World Competition. This team currently ranks first in Canada, and fifth in the world. Similar to the KraftWerx senior team, their task is based on how their robot works and performs on the field. In a match, there will be two robots, each from a different team, attempting to achieve the same goal. In addition to game-play, Aryan explains, “VEX Robotics mainly promotes STEM. In our division, we also have to do a STEM project where we research products that aren’t related to robotics, find a problem and, using robotics, determine how we can fix the problem.” Just like the senior team, they explain their task and the mechanics of competition in perfect four-part harmony. Most competition is based on combat. A winner is determined by beating the opponent. In the world of robotics and STEM ideology, the winner reigns supreme by how well they all get along. In most cases, teams are paired with and against other teams who do not necessarily speak the same language. It’s all about their ability to collaborate, manage the project, and accomplish the task while troubleshooting along the way. 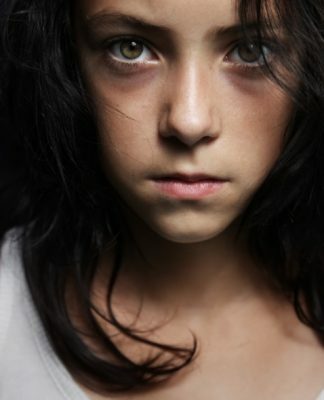 Interestingly, these experiences are opening up new conversations and career paths in the young participants. That is what STEM is all about, and probably why Brampton Mayor Linda Jeffrey has been championing towards bringing a STEM-based University which also includes the Arts to spell STEAM to Brampton. Ryerson is leading the charge as they have teamed up with Sheridan College with plans to break ground in Brampton soon. It’s obvious —whatever is in the water we drink, our well runs deep with potential. It’s encouraging to know that so many kids are wanting to pursue STEM and STEAM-oriented education and careers. They could all be the first to enroll in Brampton’s University. During Stand Up 4 Brampton’s recent interview with Ryerson’s President Dr. Mohamed Lachemi, he explained that Ryerson offers these programs, including work experience through their collaboration with St. Michael’s Hospital where biomedical engineering and science students work alongside clinicians. Now, combine this with Seneca’s World renowned robotics programs… Aamodot has a lot of educational options opening up to him. Similar career choices are being considered by the younger KraftWerx members. Shaan wants to be a zoologist and apply what he is learning in robotics to saving animals from extinction — creative. It’s exciting to see how little effort is needed to change career paths. The only flood we should worry about coming into downtown Brampton is the tsunami wave of talent that is heading this way in the very near future. Brampton’s new university is slated to begin classes September 2022. It will be just in time for these kids to be Brampton’s first STEAM students. 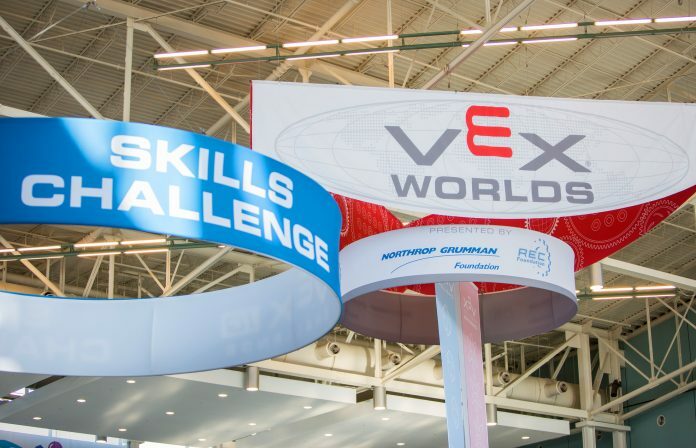 VEX Robotics World Competitions start April 25th and conclude May 1. In what is certain to be a historic day for Brampton, the Province has made its official announcement for funding of a new university campus in downtown Brampton. 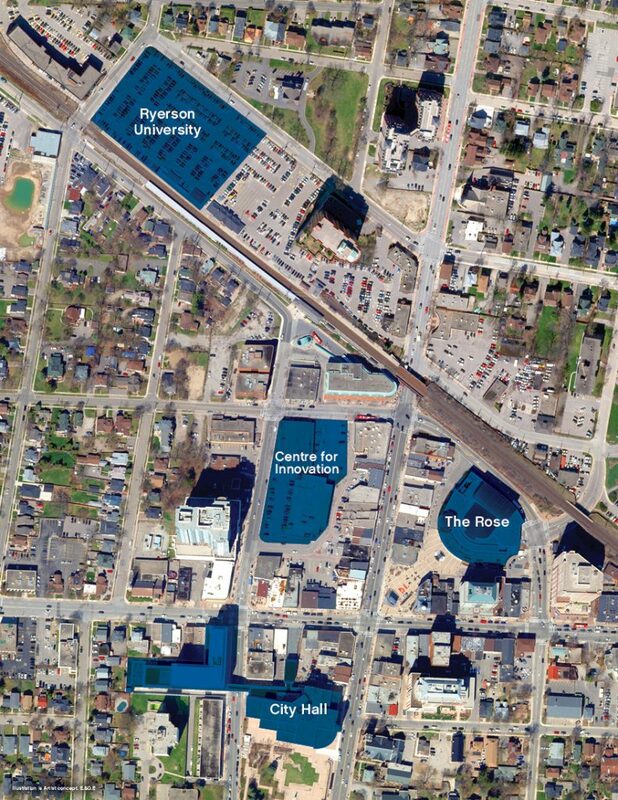 After more than a year of speculation, the location of the Ryerson University expansion was revealed at an event hosted by the Brampton Board of Trade this morning. 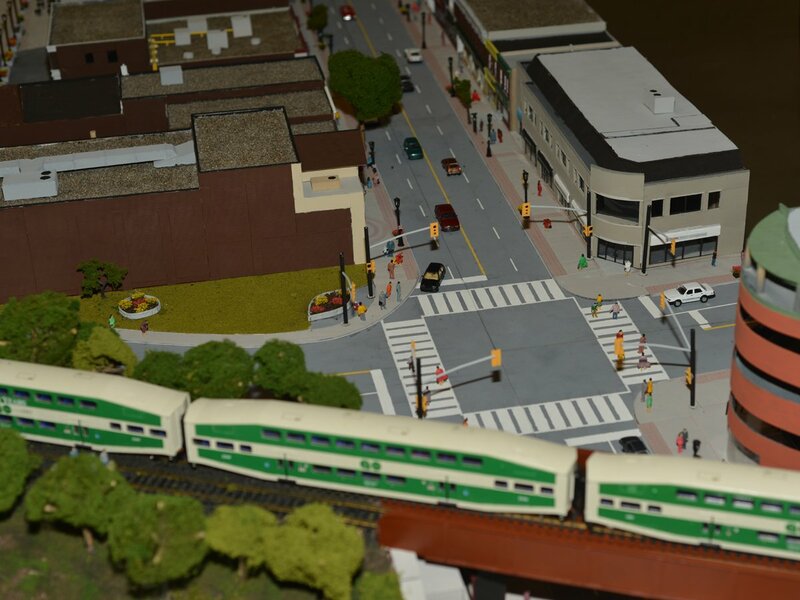 The new university is set to be located at the corner of Church Street West and Mill Street North in Brampton, presently the parking lot that forms part of the Metrolinx GO Train Station. 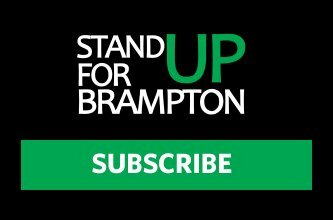 You can see our full broadcast, via Stand UP for Brampton, of this morning’s historic announcement by clicking the link at the bottom of this story. 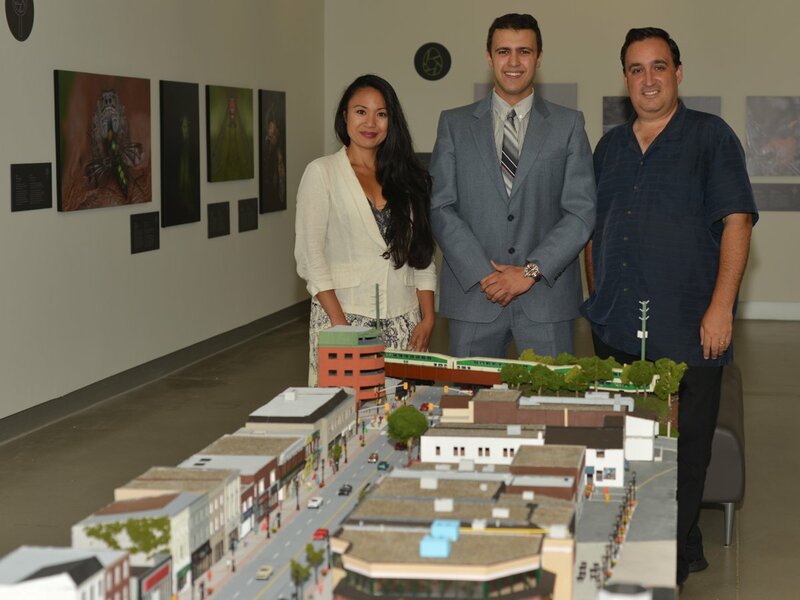 Stand UP for Brampton’s Paul Vicente and Rowena Santos met last month with Mohamed Lachemi, the President of Ryerson University, where he discussed the importance of locating the new university close to transit, particularly, along the Kitchener Rail line, dubbed the “innovation super corridor” that connects Toronto and Waterloo, with Brampton positioned at the strategic center of the two major tech hubs. 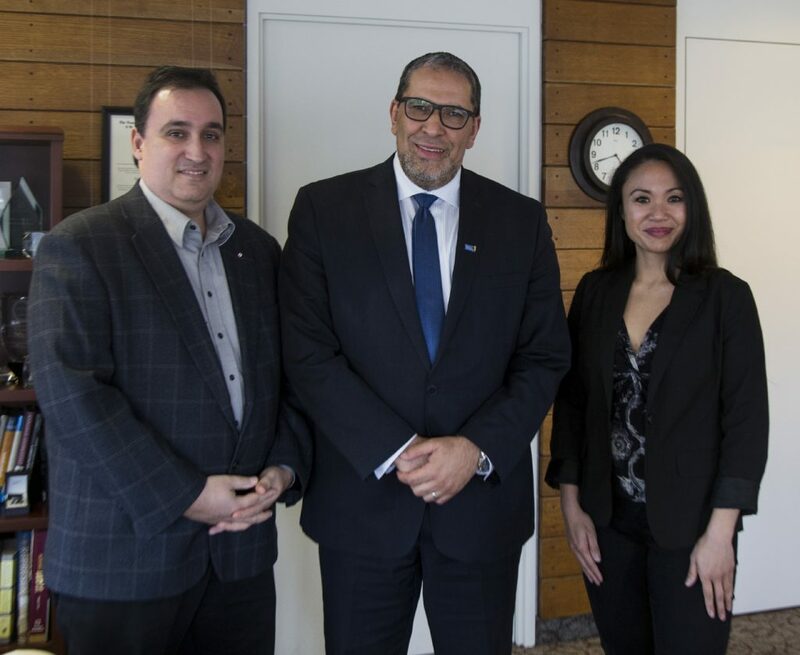 Paul Vicente, Dr. Mohamed Lachemi, and Rowena Santos, March 2018. Focusing on science, technology, engineering, arts and mathematics (STEAM), programming will be delivered in partnership by Ryerson University and Sheridan College. The new site will provide up to 2,000 new undergraduate spaces within five to 10 years. The new campus will offer specialized programs on “cyber security“, a new and burgeoning field that is a primary concern for corporations around the world. Financial institutions, banks, police services, governments, and utilities are looking at their operations and the new risks presented by global hackers looking to steal information or potentially cause disruption. The area of cyber security has become a top priority with demand for skilled people on the rise. Ontario will invest $90 million for the construction of the new postsecondary school and will also support the land purchase. 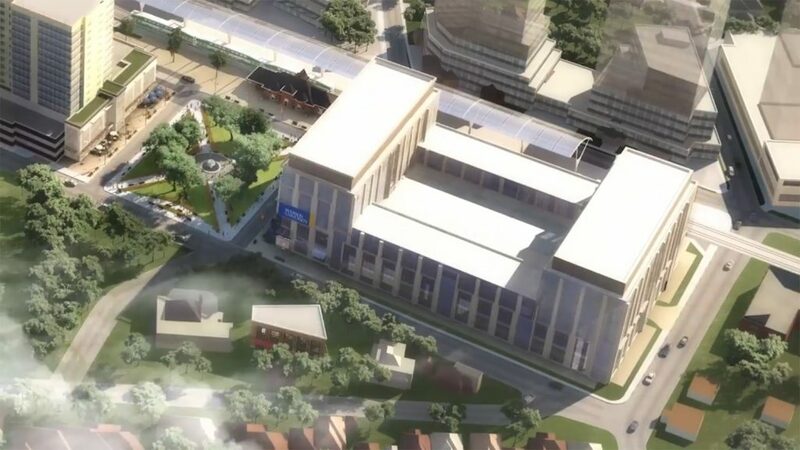 The City of Brampton has pledged $50 million over ten years towards the new university campus, and an additional $100 million toward a “joint-use centre for education, innovation and collaboration” to be also located in the downtown. 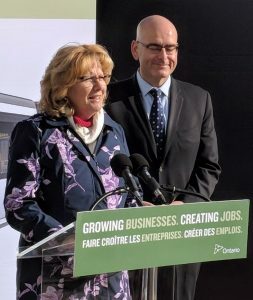 At the announcement, Brampton’s Mayor Linda Jeffrey could hardly contain her excitement, saying that this is a once in a generation opportunity for Brampton. “This will transform Brampton forever,” a smiling Jeffrey said to the attendees in the packed hall. The scene of today’s announcement, hosted by the Brampton Board of Trade. Some attendees at the event, remarked that had the City of Brampton approved the proposed plan by Metrolinx to build an LRT line along Main Street, the construction of that project would have provided an essential link to the university, and that construction for both projects would have concluded around the same time. 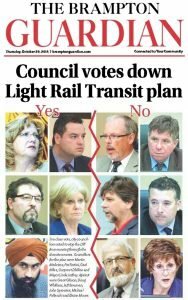 In 2015, six Councillors voted against the HMLRT plan, and instead chose to stop the line at Shoppers World. 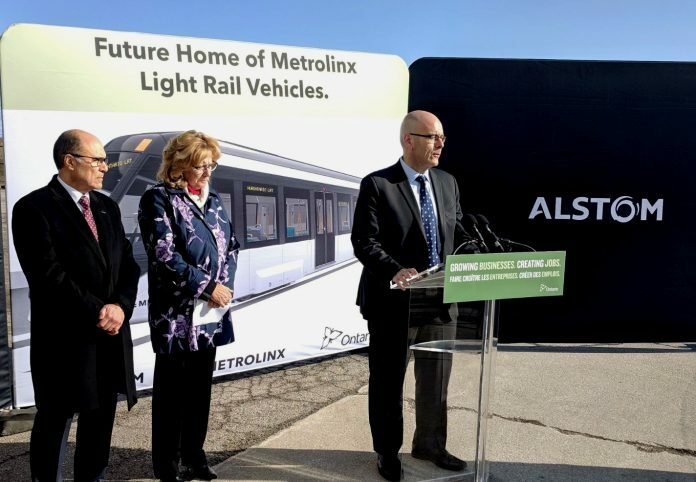 The project was set to cost $1.6 billion, with the Province of Ontario committed to paying the full amount. New economic activity is expected in Brampton as a result of today’s announcement, and the benefits to the community will include the fact that residents will have the option of attending a world-class learning institution in the heart of the city. Impacts include the creation of 3000 new construction jobs and $650 million of economic activity, and once the facility opens, 1900 permanent jobs will be supported, and $300 million of economic impact is expected every year. Planning and design on the new campus is expected to begin immediately, with construction to follow and its completion scheduled for the Fall of 2022. University announcement! A historic day for our city. At a City Council meeting today in Brampton, some Councillors questioned the need for an Integrity Commissioner to deal with complaints from the public against elected officials. The discussion was sparked by a report from Brampton’s Integrity Commissioner, Guy Giorno, who found a complaint filed by six members of Council alleging a seventh member of Council contravened the Code of Conduct was without merit. The allegation stated that the seventh member of Council breached the Code of Conduct when confidential information was revealed during a media interview. In his report, Giorno wrote that he could not find that the rules were contravened. Over the past three years, Brampton’s two Integrity Commissioners have handled at least six complaints filed against Members of Council, many of which were filed by their own colleagues who also sit on Council. Prior to that, eight complaints were filed with the Integrity Commissioner in 2014 alone. Regional Councillor John Sprovieri, himself, on the receiving end of several Integrity Commissioner investigations in this past term of office and before, stated that the taxpayers were not being well served by the Integrity Commissioner process. Sprovieri tabled a motion that City Staff should provide a report to Council on the cost of the Integrity Commissioner, and whether or not, in Staff’s opinion, there is value in having an Integrity Commissioner. The motion passed 10-1 in a recorded vote, with Councillor Grant Gibson voting against the request. According to Peter Fay, the City’s Clerk, the question is a mute issue as the Ontario Municipal Act requires that all municipalities must have an Integrity Commissioner by March, 2019. 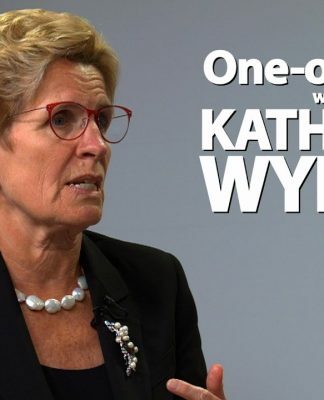 “The Municipal Act was amended last year, and it will take effect in March 2019, making Integrity Commissioners mandatory for all 444 municipalities in the Province of Ontario with additional powers, and that law is in effect,” Fay explained. Regional Councillor Elaine Moore agreed that a different process is needed at the City, saying that she believes a mediator might be a better option to assist Members of Council handle their differences. Not all were questioning the need for the Integrity Commissioner. Regional Councillor Gael Miles indicated that the Code of Conduct needs a check to hold Councillors accountable for their actions, citing situations in the past when Members of Council revealed confidential information or behaved badly. Guy Giorno is a lawyer with Fasken Martineau DuMoulin LLP, one of the largest municipal law firms in Canada. He became the City’s Integrity Commisioner last April, under a contract valued at approximately $187,500 over three years that was approved by Council in early 2017. Giorno replaced Robert Swayze, who, during his time in the role, handled several complaints for the City including some made against Sprovieri. 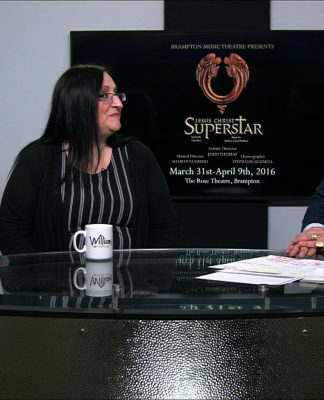 In 2015, Swayze found Councillor Sprovieri guilty of breaking the Code of Conduct for disclosing confidential information, and recommended that his pay be suspended for 60 days. At the time, Councillor Moore moved for receipt of the report from Swayze, while ignoring the recommendation for suspension of pay. 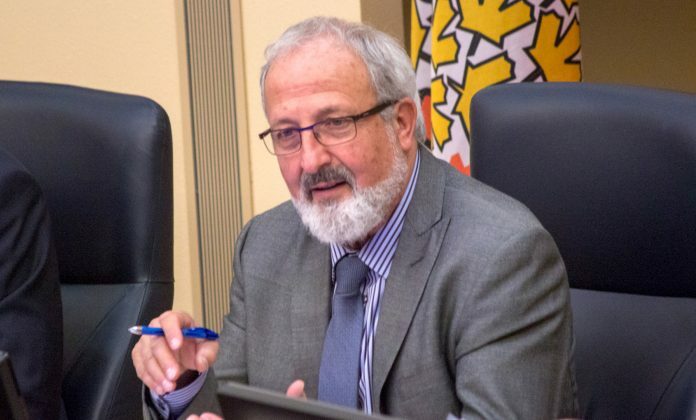 Sprovieri famously remained seated in Council Chambers during the tabling of that report, even though conflict of interest rules would have required him to leave the room. Despite the pending legislation that requires municipalities must have an Integrity Commissioner, Sprovieri insisted that Staff should provide a report, requesting that they provide information on all the costs associated with the hiring of an Integrity Commissioner, and their opinion on the value of having one.